Only a couple of hundred members of the Democratic Forces for the Liberation of Rwanda (FDLR) have so far complied with an ultimatum to disarm by 2 January and take part in a demobilization and reintegration programme. “Upon the expiry of the ultimatum, there will be no more time to talk. Our armed forces [FARDC] and partners [MONUSCO, the UN mission] will launch a military offensive to forcefully disarm the FDLR,” DRC government spokesman Lambert Mende told IRIN. MONUSCO’s military spokesman, Lt-Col Felix Prosper Basse, confirmed that the UN force would “take part in operations against the FDLR rebels with the FARDC when the deadline of 2 January 2015 is reached. Preparations and planning are ongoing in order to fulfil our mandate given by the UN Security Council. Reported to have some 1,400 fighters, FDLR was formed by leaders of the Interahamwe Hutu militia which fled to eastern DRC after carrying out much of the killing in Rwanda’s 1994 genocide. Its ranks now include many DRC nationals. “Any military action should bear the following in mind,” warned Jason Stearns, director of the Congo Research Group at New York University. “When the UN and the Congolese army launched an offensive against the FDLR in 2009, it displaced a million people and led to the deaths of thousands. “So any military action should only take place after political options have been exhausted and should be proportional to the threat,” he said. Aid workers in eastern DRC shared Stearns’ concerns. “Any military operation risks creating humanitarian fallout. In eastern Congo one of our biggest concerns is increased displacement, in areas which are already overwhelmed by the needs of displaced people on a massive scale,” Frances Charles, advocacy manager with World Vision, DRC, told IRIN. Some 1.4 million people are currently displaced in North and South Kivu provinces. “This planned offensive comes with a high level of risk, in particular to the civilian population. Measures must be put in place by MONUSCO and the FARDC to ensure that planning and conduct of operations mitigate harm to civilians. Every effort must be made to reduce and monitor human rights violations related to operations,” he said. Florent MÈhaule, head of the sub-office of the UN Office for the Coordination of Humanitarian Affairs (OCHA) in South Kivu, said aid workers in that province were “convinced that the planned military operations against FDLR will likely have humanitarian consequences in terms of protection of civilians and forced displacements with its impacts on humanitarian needs. “One of the key issues in South Kivu could be humanitarian access due to both physical constraints and security. Regarding the latter, such an offensive will probably hamper any kind of access negotiations with armed groups. In addition to difficult access, the weak humanitarian presence in the potential military operations’ areas will make it harder to quickly scale up large humanitarian operations if required,” he added. His counterpart in neighbouring North Kivu, Annarita Marcantonio warned of the risk of “a possible increase in attacks, looting and reprisals by the FDLR, as well as civilians potentially getting caught up in hostilities”. OCHA and aid agencies in eastern DRC are reportedly working with MONUSCO to develop a contingency plan for the protection of civilians in the event of a military assault against FDLR. “I am saying this because from the UNSC [UN Security Council] viewpoint it seems that the same type of operation [as was mounted in November 2013] against the M23 should be repeated. This would be a terrible mistake,” he said. “From a military perspective, FDLR is quite a different problem than M23 and it seems that the main thinking is to apply the same strategy. One military offensive will not be enough to knock out FDLR because this group is scattered from North to South Kivu and made of small units of fighters who can easily withdraw further into the bush,” he said. “So the tactical configuration is completely different from the M23. In addition, as FDLR is embedded within the communities, those ones can get involved into the fighting, and brutal retaliations by FDLR against civilians will follow the ADF [Allied Democratic Forces] example. “Those who are planning an operation against FDLR should ask whether running after FDLR in the bush will put an end to this threat. Even if this operation is a success, will it end FDLR? Certainly not, if this is a one-shot operation,” he warned. 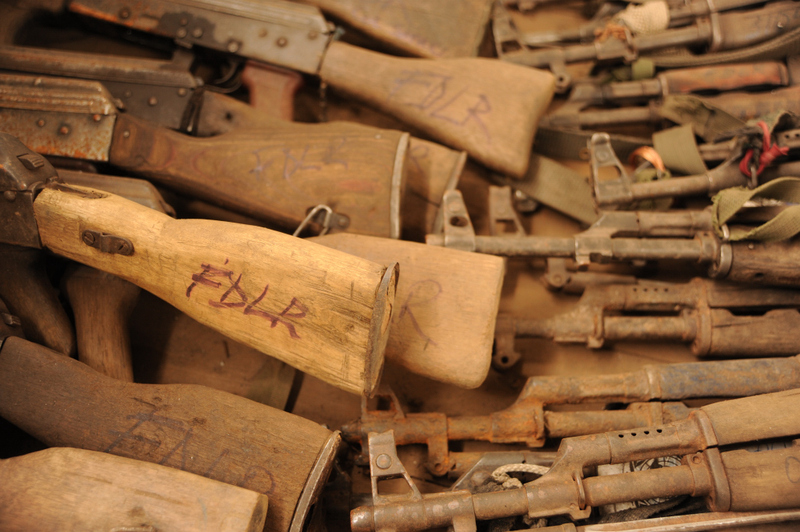 The evidence from UN experts and findings from six months of Enough Project field research in DRC suggest that FDLR is focusing on reorganizing itself in three main areas: generating more income to trade for ammunition and weapons, mobilizing political support in an attempt to gain greater legitimacy, and preparing to avoid military defeat through military alliance-building and recruitment. The report notes that this militia - responsible for grave human rights abuses, serious violations and the subject of UN sanctions - continues to generate revenue mainly by trading gold through North Kivu and Uganda and by illegally producing and trading charcoal from Virunga National Park, a trade worth an estimated US$32 million per year. “The group is using part of that revenue to purchase ammunition and arms from Congolese army [FARDC] officers, with whom it continues to collaborate and share intelligence,” says the report. Mende denied these allegations. The report noted that FDLR’s current strategy is consistent with its long-time pattern of responding to military pressure. “In this pattern, the group promises to disarm and reiterates its political aspirations for recognition as a Rwandan opposition group. FDLR then uses any reprieve to regroup by building military alliances and increasing economic activity and recruitment,” said the report. FARDC and FDLR have on occasion in recent years worked in alliance with each other against common enemies.